Set oven to 350 degrees, and grease your cake pan. Kat used a silicon Bundt pan, but the original recipe calls for a 9″x13″ tin. I decided to also use a Bundt pan. Sift the flour and sugar together into a large bowl. Set aside. In a separate mixing bowl, mix the milk, vanilla, baking soda and eggs. Set aside. Bring the butter, water and cocoa to a boil over medium heat. When done boiling gradually pour into the flour/sugar mixture and stir to combine. Follow this with the milk mixture and fold all ingredients together. Pour into your prepared pan and bake for 30 minutes. 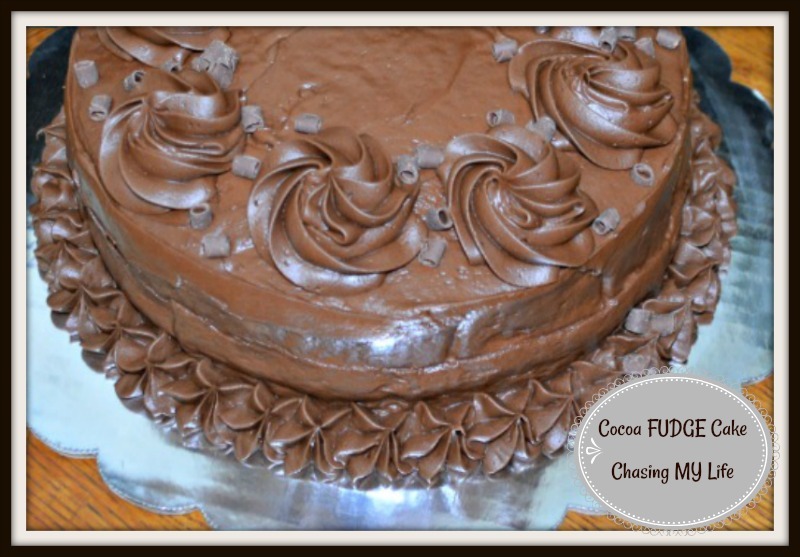 Because this is a fudge cake – you don’t want the center to be cooked all the way through, but the outside should be firm enough to hold its own when removed from the pan. Joanne Fluke suggests this should take 20-25 minutes. Best served warm, and reheats brilliantly. Enjoy!